Photo of a eucalyptus plantation. Photo: Campaign to Stop GE Trees. In an effort to boost profits from monoculture tree plantations, tree biotechnology companies are developing genetically engineered (GE) varieties of pine, poplar, eucalyptus, and other species with characteristics such as rapid growth, pest resistance, and low levels of lignin for biofuel production. 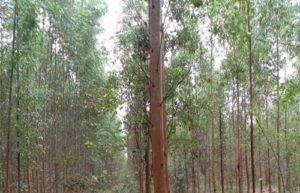 Led by US-based Arborgen and Futuragene – a spinoff from Brazilian pulp giant Suzano – several companies along with a number of academic institutions are seeking to develop genetically engineered (GE) varieties of pine, poplar, eucalyptus, and other species. The traits they are engineering include rapid growth, pest, disease and stress resistance, and altered lignin production, among others. The goal is to produce “more wood”, and to custom engineer trees to meet the needs of pulp and biofuel producers. Some are working to engineer disease resistant trees, which, they argue, would enable reintroduction of species like the American Chestnut. But GE trees are far from a “sustainable” solution to climate change. Their introduction would likely exacerbate the serious issues already engendered by monoculture tree plantations – ranging from biodiversity loss, soil degradation, mining of groundwater, and human rights abuses due to land grabs. Furthermore, there is an extremely high risk of irreversible ecological impacts such as cross-contamination with native species, or the invasive spreading of a species like GE eucalyptus. Due to these risks, Biofuelwatch supports the call for a global ban on the testing and commercial deployment of GE trees, and is a founding steering committee member of the International Campaign to Stop GE Trees. We believe it is imperative that we reduce demand for wood and wood products rather than pretend GE trees can fulfill ever-expanding demand.